Flour sometimes contains calcium phosphate. 3 Will Cream of Tartar Whiten Teeth? 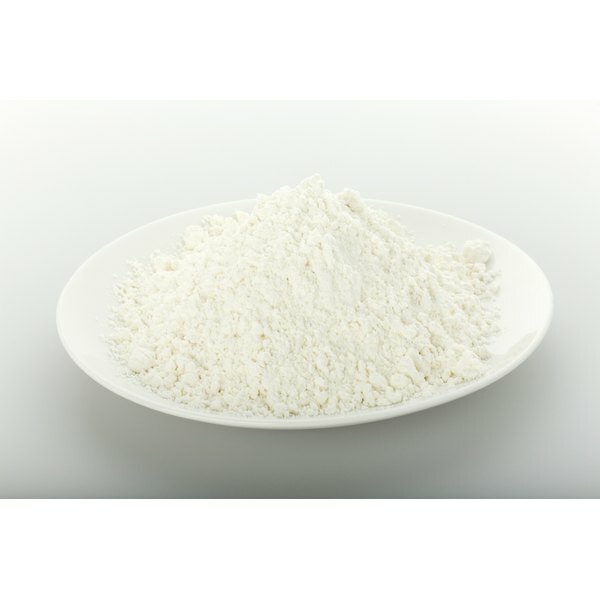 Calcium phosphate can be used as a supplement to increase your calcium and phosphorus intake, but it's also used as a food additive. Calcium phosphate can help thicken, stabilize and firm foods. It's also used to help blend oil- and water-based ingredients, prevent caking, retain moisture, regulate acidity and treat flour. Not surprisingly, calcium phosphate is found in many processed foods. People with chronic kidney disease may need to watch their calcium phosphate intake, however, as it could adversely affect their health if they get too much phosphorus. Foods that can contain this additive include flour, bread and other baked goods such as store-bought pies, cakes and pastries. Anything battered or breaded, breakfast cereals, crackers and pasta can contain calcium phosphate. If you buy processed fruits or vegetables, such as canned tomatoes, potatoes, red and green peppers and carrots or fruit juice, they may also be a source of calcium phosphate. Dairy products, such as cheese, powdered milk, buttermilk, dairy-based drinks, dairy-based desserts, cream, condensed milk and butter, are potential sources of calcium phosphate. Sweet treats -- including soda, cocoa products, candied fruit, candies, chewing gum, edible ices, egg-based desserts, fruit-based desserts, artificially sweetened jelly and preserves, syrups and sugars -- can also sometimes contain this additive. Soy products, processed meats and seafood, soups, sauces and condiments, water-based beverages, mead and alcoholic beverages are other foods that can contain calcium phosphate. Frozen dinners, fast foods and broth-enhanced meats are other sources.